Nerve cells, otherwise known as neurons, have long extensions called axons. Nerve impulses travel down these axons, away from the cell body towards another neuron that is connected to the neuron. The axons of some neurons are insulated with a special substance called myelin the layer of myelin that surrounds the axon. This “myelin sheath” acts as a protective covering composed of protein and lipids. Axons can vary in length from anywhere to 1 millimeter or less to 1 meter. Sometimes, axons are bundled together to form nerves that transmit electrical nerve impulses across the body. While myelin protects and insulates axons, it also enhances the speed at which nerve impulses are transmitted through the axon. Axons without myelin sheaths conduct nerve impulses continuously throughout the axon. 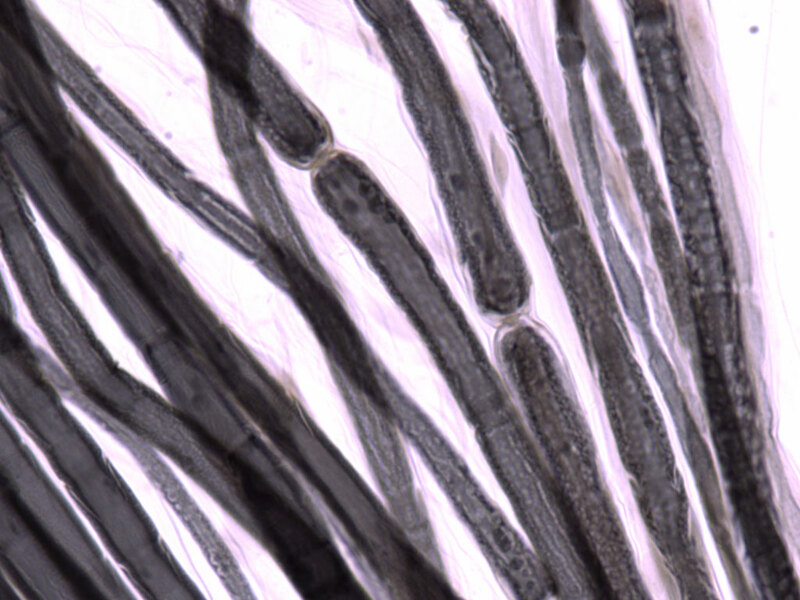 However, myelinated axons have small, uncovered gaps in the myelin sheath called nodes of Ranvier. Myelinated axons can only conduct nerve impulse at the nodes of Ranvier. Consequently, the nerve impulse jumps from node to node, greatly increasing the speed of nerve impulse conduction. If myelin is damaged, the speed of nerve impulse transmission slows substantially. Multiple sclerosis is one example of a disease that causes systematic loss of the myelin sheath. 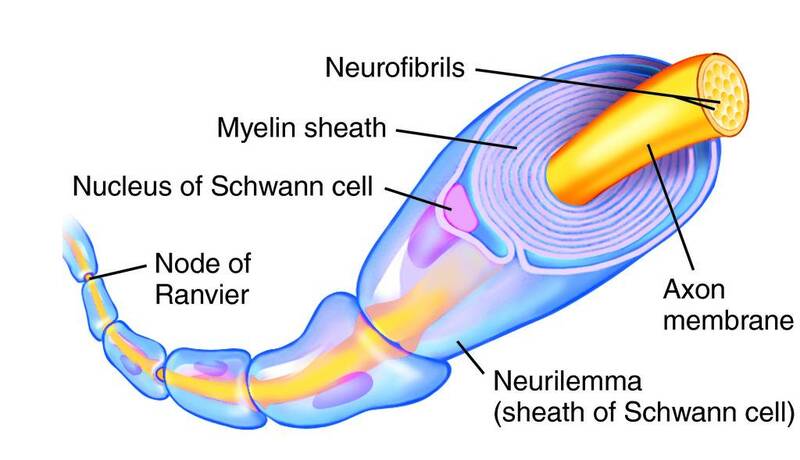 Inflammatory demyelinating diseases also cause progressive damage and loss of the myelin sheath. Regenerating the myelin sheath in these patients is one of the goals of regenerative medicine. A good deal of data tells us that endogenous remyelination does occur. Unfortunately, this process is overwhelmed by the degree of demyelination in these diseases. A stem cell population called the parenchymal oligodendrocyte progenitor cells and endogenous adult neural stem cells in the brain are known to remyelinate demyelinated axons. The Salzer laboratory at the New York Neuroscience Institute examined the ability of a specific adult neural stem cell population to remyelinate axons. These stem cells expressed the transcription factor Gli1. Salzer and his team showed that this subventricular zone-specific group of neural stem cells were efficiently recruited to demyelinated portions of the brain. This same neural stem cell population was never observed entering healthy axon tracts. This finding shows that these cells seem to specialize in making new myelin sheaths for damaged axon tracts. Since these neural stem cells expressed Gli1, and since there are drugs that can inhibit Gli1 activity, Salzer’s group wanted to show that Gli1 was a necessary factor for neural stem cell activity. Surprisingly, differentiation of these neural stem cells into oligodendrocytes (which make myelin and remyelinate axons) is significantly enhanced by inhibition of Gli1. A specific signaling pathway called the hedgehog pathway is known to activate Gli1 and other members of the Gli gene family. However, when the hedgehog pathway in these neural stem cells was completely inhibited, it did not have the same effect and Gli1 inhibition. This suggests that Gli1 is doing more than responding to the hedgehog pathway in these neural stem cells. Salzer and his colleagues showed that Gli1 inhibition improved myelin deposition in an animal model of experimental autoimmune encephalomyelitis; an inflammatory demyelination disease. Thus, inhibition of Gli1 activity in this preclinical model system increase regeneration of the myelin sheath in demyelinated neurons. This work elegantly showed that endogenous neural stem cells that can remyelinate axons are present and can be activated by inhibiting Gli1. Furthermore, this activation will nicely enhance the therapeutic capacity of these endogenous cells. This potentially identifies a new therapeutic avenue for the treatment of demyelinating disorders. This work was published in Nature. 2015 Oct 15;526(7573):448-52. doi: 10.1038/nature14957. Inhibition of Gli1 mobilizes endogenous neural stem cells for remyelination. Nature. 2015 Oct 15;526(7573):448-52. http://dx.doi.org:/10.1038/nature14957 Epub 2015 Sep 30. Enhancing repair of myelin is an important but still elusive therapeutic goal in many neurological disorders. In multiple sclerosis, an inflammatory demyelinating disease, endogenous remyelination does occur but is frequently insufficient to restore function. Both parenchymal oligodendrocyte progenitor cells and endogenous adult neural stem cells resident within the subventricular zone are known sources of remyelinating cells. Here we characterize the contribution to remyelination of a subset of adult neural stem cells, identified by their expression of Gli1, a transcriptional effector of the sonic hedgehog pathway. We show that these cells are recruited from the subventricular zone to populate demyelinated lesions in the forebrain but never enter healthy, white matter tracts. Unexpectedly, recruitment of this pool of neural stem cells, and their differentiation into oligodendrocytes, is significantly enhanced by genetic or pharmacological inhibition of Gli1. Importantly, complete inhibition of canonical hedgehog signalling was ineffective, indicating that the role of Gli1 both in augmenting hedgehog signalling and in retarding myelination is specialized. Indeed, inhibition of Gli1 improves the functional outcome in a relapsing/remitting model of experimental autoimmune encephalomyelitis and is neuroprotective. Thus, endogenous neural stem cells can be mobilized for the repair of demyelinated lesions by inhibiting Gli1, identifying a new therapeutic avenue for the treatment of demyelinating disorders.